Prices Exclude VAT Vectorworks Pricing in Ireland from AxonWare. Get Vectorworks Fundamentals/Basic 201. Order Online from the leading Vectorworks Discount Reseller in Dublin Ph:+353-16535178. Best place to Buy Vectorworks. Vectorworks Fundamentals has everything you need for precision 2D drafting, powerful 3D modeling, and sophisticated client presentations. Plus, it has built-in database and spreadsheet capabilities to track costs and materials, and a flexible scripting language to automate routine drafting tasks. No other CAD program offers so much for so little! Hey didnt I have that in a previous version? "It never really had it. In Fundamentals, Export PDF just routed you to File > Print > Save as PDF, which you can still go to now. However you will have to configure the page area to encompass all of the drawing otherwise it will slice it up like you saw. They removed that shortcut since so many Fundamentals users were confused why they didn't have the full PDF Export settings like layers/classes as PDF layers, etc. that the Design series versions of Vectorworks get. " Unlike lite CAD programs, Vectorworks Fundamentals goes way beyond 2D. In addition to precision drafting, you’ll find powerful tools for 3D modeling that can help you create, present and even manufacture your designs. Built-in database and worksheet capabilities help track costs and materials. A host of import/export features makes sharing files easy. You also get free object libraries, as well as a built-in scripting environment that automates routine tasks. 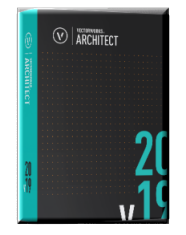 Vectorworks Fundamentals is one of the world's best selling CAD products and is available in over 85 countries and is translated in 14 languages. Developed by Nemetschek has developed CAD software since 1985. • Nemetschek AG, one of the world’s leading Information Technology companies for the design, construction and management of buildings and real estate with more than 170,000 customers in 142 countries.